November is National Adoption Month, and I’ve invited some experts to guest post on my blog throughout the month! Today, please give a warm welcome to Beth Guckenberger! Sometimes I have the great privilege of sharing with the NASCAR community in their pre-race chapels. I first met them through their chaplain, and then started going to a couple of races a year and sharing with them about orphan care and how I have seen God go to bat for kids around the world. 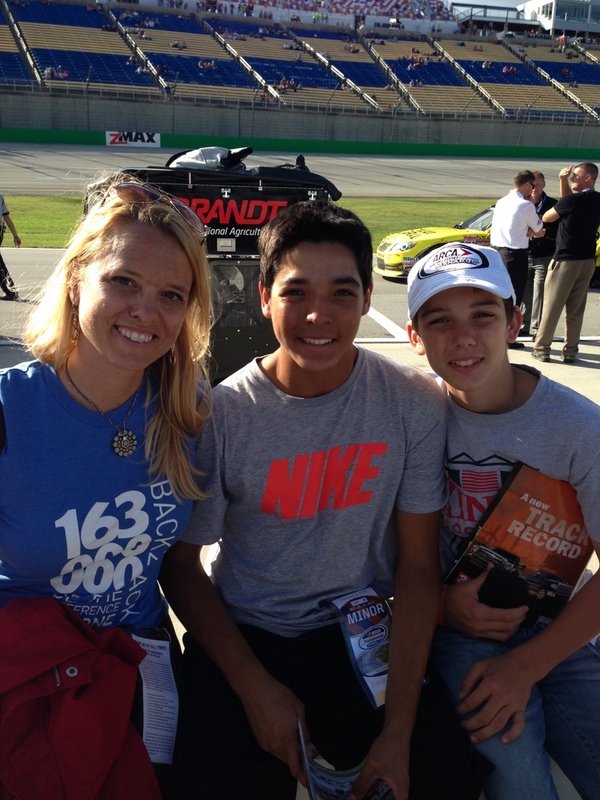 Last month, I was at the Kentucky Speedway, and I brought two of my sons with me, one being my adopted fifteen-year-old son, Evan. We spent the hours before chapel talking to the community—drivers, mechanics, media personnel—hearing about the hard stuff they were experiencing, even in the glamorous lifestyle they enjoyed. We are not immune, no matter who we are and what we do. With all of that swirling around my heart and head, I leaned over and whispered to Evan, “Can I share our story in chapel with the drivers? Can we tell them that nothing is impossible?” He smiled and nodded, nervous a bit. I took the stage, just an hour before the checkered flag, and began to share with the drivers and crew chiefs, family members, and teams about the day when God asked us to adopt a special-needs baby. I shared how overwhelmed I was, how inexperienced, how there were nights I questioned God, our future, and his goodness. I told them we eventually received a diagnosis of severe cerebral palsy, and the news of Evan’s never being able to walk was devastating. Then I shared of one afternoon, of a normal moment that turned miraculous, not because I woke up and did or prayed anything different, not because we earned or deserved what happened, but because God is sovereign and at the end of the day, we either submit to it or fight against it. Evan didn’t even army crawl; he was at that time a-year-and-a-half and couldn’t even move. We had daily therapies and were seeing no real progress, and yet . . . that one afternoon, frustrated with his sister and desiring the toy she had taken from him, he pushed himself across the floor (the start of the miracle! ), pulled himself up on a couch (the tears started here! ), cruised across the full-length couch (this started the phone call to my husband!) and walked across the room (hallelujah!). As I shared the sequence of events in those moments, I motioned for my strapping, high school football player, Evan, to walk forward and join me on stage, and as he stood there, everyone gasped. Ever the proud mama, I told of touchdowns and athletic accomplishments, trying to “prove” when God decides to heal, it’s complete. Beth and her husband, Todd, live with their family in Monterrey, Mexico, where they serve with Back2Back Ministries, an international orphan care ministry headquartered in Cincinnati, Ohio. They both graduated from Indiana University with degrees in education and between biological, foster, and adopted, are raising nine children. Currently the ministry has operations on three different continents (Mexico, India, and Nigeria). The Guckenberger’s have lived in Monterrey since 1997 and in that time have hosted thousands of guests on the ministry campus. Beth is the author of Reckless Faith (Zondervan, 2008), Relentless Hope (Standard Publishing, 2010), Tales of the Not Forgotten (Standard Publishing, 2012), and Tales of the Defended Ones (Standard Publishing, 2013). Beth is the recipient of the the 2013 International Network of Children’s Ministry Legacy Award and the Cincinnati Christian University’s 2012 Salute to Leaders Award for her and Back2Back’s impact on children internationally. She travels and speaks regularly at conferences, youth gatherings and church services. Beth is also a co-host on Real Life, Real Talk on Saturdays at 8am on Sirius-XM 131. Her topics include, but are not limited to, orphan care, missions, ministry, parenting, marriage/intimacy, and general faith. Her style is story-telling and she draws from her field experience as a missionary and parent of nine children for illustrations to biblical concepts. Connect with Beth at her website or via Facebook and Twitter. Looking for a Christmas present to give to a reader this holiday season? Why not give a copy of Love Finds You in Glacier Bay, Alaska? I love this story, Beth. THANK YOU for sharing! !